Central America meets Middle East as the this capital named restaurant ‘Beirut’ serves up the finest lebanese food in Panama. Located in the heart of the Banking District of Area Bancaria, Beirut has an extremely loyal following from locals and visitors alike with its awesome eastern décor, fresh food, ambiance and hookah’s! Opened 7 days a weeks 365 days a year Beirut is a great start to any vacation stay. Large groups, small groups shouldn’t fear as this place has enough seating to accommodate any size party. Popular Items include Chicken/Steak Skewers, Hummus, Dolmas, Labhna, desserts, pastries and just about any other western compliment you can think of including hamburgers, pastas & pizzas. On Weekends, the restaurant brings in entertainment in the form of Belly Dancers who grace the dance floor maneuvering their bodies through the aisle with the snap of their fingers. 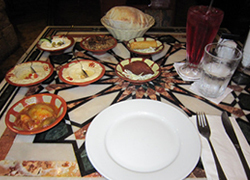 Recommended for any visitor or party to Panama, Beirut offers the finest in middle eastern dining and with its wide menu variety anyone can find a delectable item worth consuming.